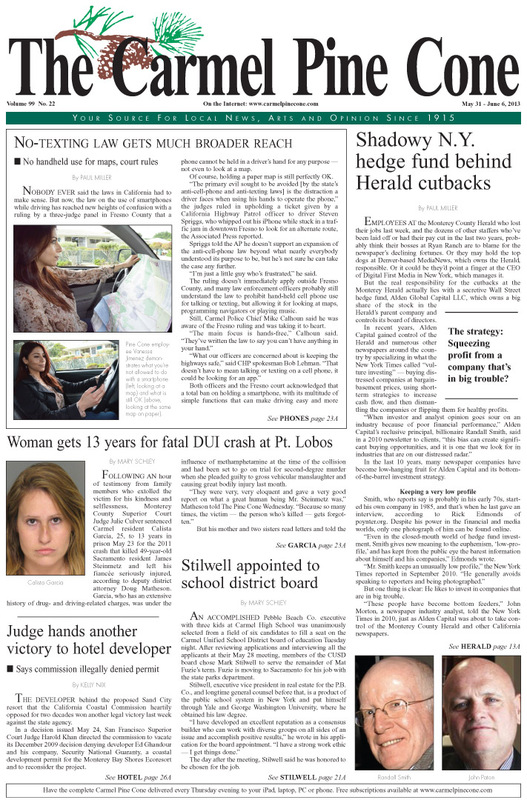 In our lead story this week, I shed more light on the steady decline of the Monterey County Herald, and reveal that a secretive New York hedge fund is behind the once-proud newspaper's recent cutbacks. One of our letters to the editor, however, belittles our coverage of the Herald's woes, and attributes it to something the writer thinks happened to me in elementary school ... more preview. To download the May 31, 2013, front page, please click here (1 mb). To download the May 31, 2013, Main News section, please click here (13 mb). To download the May 31, 2013, Real Estate section, please click here (17 mb).